Join us for upcoming events, classes and programs at South River Public Library! All events are free and open to the public. Registration required where noted. Want to get out of the house and meet other kids and caregivers? Want your child to learn some foundational skills? Want to give your child a chance to meet and play with others? Then come to the library for Little Learners! We will have books, crafts, songs and socialization. The Library will be closed in observance of Easter. 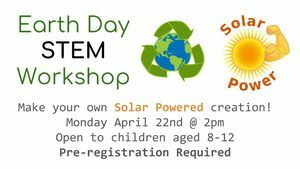 Celebrate Earth Day by using solar-powered renewable energy kits to make motors, robots, and more! Held in upstairs conference room @ 2pm. Registration required, for children aged 8-12. Are you new to chess, or maybe not new to chess? Do you want to learn the game but are a bit embarassed that you never were taught and you have no one patient enough to work with you? Or you enjoy the game but you want to become more sophisticated, and you could use some advanced training? This is the group for you! You will train students, or study some advanced maneuvers, but everyone will receive the same patient, kind teaching. Everyone can become comfortable in this world renown, very old game! There will be no Kid's chess this week because I am out of town Sponsored by Larry. Tuesday, Apr. 23, 7:00-8:00 P.M. The Library Board of Trustees will meet in the Sivess Room. Join us as our instructor, Miss Rita, teaches our students building block skills for early education. There will be books, songs, crafts, and socialization! Ages 3-5. This is a stress free class for adult learners, geared for people who may not have learned the game when they were younger. or have not played in a long time. There will be no adult chess as I am out of town this week Sponsored by Larry. Meet you at the track! Join our teen advisory board members for a story and craft.